So many opportunities for businesses and entrepreneurs exist today, thanks in large part to the internet. It has never been easier to put your product or service in front of countless consumers. From search engine optimization strategies to email marketing, brands and businesses have been using a variety of methods for more than 20 years to reach their target audiences. Fortunately, social media has made it even easier – and more effective in some cases – to reach and successfully convert plenty of customers. If your brand wants to sell more and you have a social media presence ready-to-go, then continue reading to find out more. With so many people now engaging in local consumerism via social media, it comes as no surprise that Facebook has recently unveiled its Marketplace function. It is here that you’ll be able to start pinging servers with individual items for sale in a way comparable to popular sites like Craiglist. It is worth noting that this method is ideal for small businesses and individuals rather than online-exclusive brands: page owners and brands in general cannot use the Marketplace to consistently sell items. Nevertheless, if you have a product to offer within a local community and are still producing small batches of them, the Marketplace service may come in handy. Social media networks are heavily reliant on ad revenue. Facebook in particular discovered that it could rapidly grow its coffers by opening its armada of data to everybody for use. Social media marketing efforts via ads are still cost effective solutions that put your ad in front of precisely who needs to see it. You can customize ads based on a variety of categories: from age and location to political preferences and past shopping habits, there are many ways to reach people through social media. By using this low-cost platform, you’ll dramatically increase your brand’s reach, touch those who are most likely to purchase your products, and inevitably succeed at selling products/services. Two social media networks in particular are very useful for reaching those who are ready to buy. Pinterest is an ideal social media network for consumerism, as it allows users and brands to pin various items together to showcase how they look and function. You can embed direct links to each product on Pinterest, making it easy to do both the marketing and the persuasion simultaneously. With Instagram, the focus is on showcasing the item(s) in question. Whether you’re promoting a new line of clothing, a four-course meal or a brand new electronic, the platform helps maximize the impression you can make with each photos. Thanks to a variety of photo-tweaking solutions, you can really sell any product or service in its best light on Instagram. 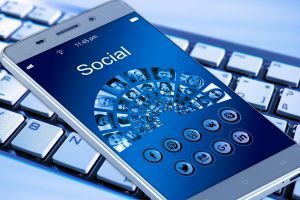 Selling products and services on social media can seem intimidating at first, but there are so many ways that you can approach it. Whether you are directly selling products via marketplaces, showcasing services via multimedia or targeting people with relevant ads, social media has made it much easier to promote your product to the right people and in the right context.